Cognitive FX has successfully helped over 1000 patients dealing with long-term concussion symptoms. A week-long program designed to effectively treat post-concussion syndrome or symptoms. Learn more about how EPIC Treatment works. Post-concussion syndrome or symptoms (PCS), is much more common than many may know. PCS is when concussion symptoms continue for months or years after an initial concussion or brain injury. Many times patients go a long time without much hope or support when living with PCS. Symptoms may evolve over time and appear to be caused by something other than the concussion or mild Traumatic Brain Injury (mTBI). Many times doctors look in other places as the source of the symptoms, other than the brain. Symptoms can be broken up into four different categories, Emotional, Physical, Cognitive, and Sleep. PCS impacts many, if not all, areas of life, including quality of life. Emotional symptoms can include depression and anxiety, and can easily be confused with other mental health conditions. Physical symptoms can include headaches, vision, light or noise sensitivity. Cognitive symptoms can include memory problems, finding the right word, and difficulty focusing. Sleep can be impacted in a variety of ways including, getting too much sleep or not getting enough sleep. Overall, in the past being diagnosed with PCS was essentially a dead end diagnosis. At Cognitive FX, we found that treating and recovering from PCS is possible with the right understanding and knowledge of the brain and its ability to heal. "The method they use here is not a one size fits all. They work together and have a team that works so that your interests are the main goal and I am pleased and I am happy to recommend Cognitive FX to anyone and everyone." The brainstem is made up of the midbrain, medulla, and pons. This part of the brain connects the other parts of the brain to the spinal cord. The brainstem is responsible for maintaining your vitals like heart rate, breathing, and body temperature. It also contributes to other functions like sneezing, coughing, and swallowing. Concussion Symptoms: In a concussion caused by a sudden head twist, the brainstem can be temporarily separated from the spinal cord, which can effectively sever the corpus callosum (the connective tissues between the right and left hemispheres of the brain). The portion of the brainstem that controls lens focusing in our eyes can be damaged in a concussion, resulting in vision impairment. After a concussion, injury to the brain stem can also contribute to nausea. The cerebellum is the part of the brain directly under the cerebrum. The primary responsibility of this part of the brain is to help coordinate muscles and maintain balance. Your cerebellum helps you with your posture. Concussion Symptoms: A concussion that damages the cerebellum can result in uncoordinated and slow movements, dizziness, and/or loss of balance. An individual may stagger and have a lack of coordination when moving. Damage to this area of the brain results in a tendency to fall, slight tremors, an inability to perform rapid movements, and a patient may even have slurred speech. The temporal lobe, like the parietal lobe, helps us understand what we hear and, therefore, aids our understanding and interpretation of language. It also helps us to retain information and interpret sound. The temporal lobe also contributes to our ability to organize. Concussion Symptoms: The temporal lobe is another highly vulnerable area of the brain. Damages to the temporal lobe due to closed-head injuries like concussions can result in sensitivity to sounds. A person may have an impaired ability to hear and comprehend language. Damage to the temporal lobe can also affect short and long-term memory, making it difficult if not impossible to remember words, people, things, names, past experiences and more. When this part of the brain is injured, it can also make it hard for someone to get good sleep. Some people may even have seizures after a concussion due to damage to the temporal lobe. The primary responsibility of the occipital lobe is to help us interpret what we see. It helps us convert the image our eyes see into colors, light, and movement. Concussion Symptoms: Damage to the occipital lobe can cause sensitivity to light, loss of vision and/or create hallucinations. A person with damage to this area of the brain may experience double vision or have difficulty seeing nearby objects. Problems with vision is a common symptom for individuals who have gotten a concussion. The parietal lobe helps us move and determines spatial orientation. It is also responsible for depth perception, connecting the senses, and processing stimuli. Concussion Symptoms: If damage is caused to the parietal lobe after a concussion, a patient will likely have difficulty reading, or they may get lost a lot. Damage to this area of the brain also impairs a person’s ability to find things. They may also have a hard time distinguishing left from right, making it hard for them to follow navigation and get from one location to the next. Patients with damage to this area may be clumsy, or struggle to recognize where their body is in location to objects around them. The frontal lobe in the cerebrum contributes most to your personality. We rely on this section of the brain to determine our behavior, emotions, and rational thinking or executive function. The frontal lobe also helps regulate body movement and contributes to our ability to write and speak. Concussion Symptoms: The frontal lobe is one of the most vulnerable areas of the brain due to its proximity to the skull. A concussion can affect the frontal lobe by impairing judgment, impacting attention span and organization. Serious damage to the frontal lobe caused by concussions or other brain injuries can result in loss of motivation and irrational or impulsive behavior. Other common symptoms that can come from an injury include depression and anxiety, confusion, brain fog, poor concentration, and headaches. Click a different part of the brain in order to determine the effect a concussion can have on each part. 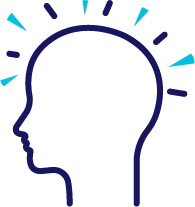 Enhanced Performance in Cognition (EPIC) Treatment is a week-long program designed to effectively treat post-concussion syndrome or symptoms. During this week, not only will we treat your injury and symptoms but you will begin to establish a new routine that will empower you to have a higher quality of life. EPIC Treatment includes two fNCI scans, a neck and brain MRI, and a week of intensive therapy specific to each patient’s brain injury and symptoms. This makes our methodology effective and unique. Typically, each patient has a scheduled daily routine with appointments taking place between 8 am to 6 pm. Each patient will receive an average of 26 hours of therapy throughout the week. Patients meet with a multidisciplinary team of therapists and trainers each day. The experience at Cognitive FX is exclusive because each therapist and trainer is a distinguished professional in their individual field. Every patient receives treatment unique to their injury and symptoms, empowering them to truly improve and to restore their quality of life over time. It is important to recognize that while the tasks and exercises may be challenging, we are here to help and support you throughout this entire process. Each individual will have different outcomes as every injury is unique. With that being said, those who come to treatment with a positive attitude, are willing to do all exercises, and trust our therapists, have a better overall experience while they are here. Functional Neurocognitive Imaging (fNCI) is foundational to the success our patients experience during treatment. Each therapist will use the results of each patients fNCI to target and individualize the exercises done in each therapy appointment. This scan guides our therapists and it empowers patients to better understand what is happening with their own brain. At the end of the week, each patient does another scan to compare their brain to the beginning of the week. Prior to EPIC Treatment, many patients have been told there is nothing to be done about PCS. They make adjustments to their life to compensate for or work around, their brain injury and their symptoms. This leaves many patients with a lower quality of life after an injury. Our focus is not to teach patients how to compensate, but to actively rehabilitate the parts of the brain that have been injured. With the fNCI, our therapists know exactly what exercises each patient needs to do to rehabilitate their brain. Treatment is based on each individual's needs and differs for each patient according to their brain scan and their specific symptoms. Treating the root cause of their injury, brain dysfunction, and not simply the symptoms is vital to seeing lasting improvements. During each day of treatment, patients will go from one therapist to the next with short breaks, and a lunch break. The whole week is intensive and it is vital that patients participate fully in all therapy appointments. A schedule might look like going from occupational therapy, to vision therapy, to cognitive therapy, to lunch, to neuromuscular therapy, to psychotherapy, and then ending with sensory-motor therapy. Each therapist knows how hard to push each patient, and will adapt to a patient's individual needs. Every therapist has been trained to understand and apply the information from a patient's fNCI to create effective treatment sessions. Cognitive therapy appointments give patients a variety of exercises to address cognitive issues, such as processing speed, attention difficulties, sensitivity to noise, memory problems and more. Cognitive therapy is effective at addressing many of the cognitive symptoms caused by PCS. Cognitive therapy is administered by Speech-Language Pathologists who are certified and accredited in their field. In occupational therapy and sensory motor therapy, patients participate in individual exercises to address visual problems, including sensitivity to light, vertigo resulting from eye movement or fatigue, balance challenges, and more. These exercises are designed to challenge you and to help regulate the necessary regions of the brain. Overall, these therapies will help with all four categories of symptoms including emotional, cognitive, physical, and sleep. You will work closely with our neuro-occupational therapists and sensory-motor trainers during your specific sessions. Neuromuscular therapy includes physical exercises to regulate heart rate. Neuromuscular therapy also includes massage techniques used to retrain the body to work better with the brain. These exercises may be challenging but are always adjusted to meet each patients needs and abilities. Neuromuscular therapy will address the most common physical symptoms of concussion, including headaches, dizziness, nausea, and more. Psychotherapy, mindfulness training, and journaling help address the emotional difficulties that come with brain injury. Patients meet with a psychologist to evaluate needs during treatment and their therapist will make a referral for any additional psychological support a patient may need moving forward after treatment. Throughout treatment, therapists discuss daily habits with each patient and give recommendations for improvements. It is important to understand that nutrition, hydration, and sleep play a significant role in brain health during treatment, recovery, and for life. EPIC Treatment takes the whole team to bring results—including you! Treatment can be challenging, but as our patients, therapists, and trainers work together with a positive attitude, we see extraordinary results. Going through treatment is vital for making significant improvements in PCS, but it is not the end of your recovery journey. Treatment is the beginning of a new way to take care of your brain and to live a higher quality of life. Each patient will receive a post-care plan to help them adjust to this new mindset. At the end of treatment, each patient will meet with a patient care coordinator to create a post-care plan. This plan will incorporate therapist recommendations and empower patients to make adjustments in their daily routine for continual improvements at home. Patients also receive a post-treatment follow up phone calls a couple weeks after they finish treatment, and three months after leaving our clinic. Do I need to get work or school off for EPIC Treatment? During your treatment you will be in back-to-back appointments, leaving no time to participate in other activities while at the clinic. Due to the intensive nature of EPIC Treatment, it is highly recommended that you do not participate in either work or school for your week of treatment. Do I need to get off any medications before EPIC Treatment? Every individual circumstance and the medications each patient takes are different. During your consultation, we will address your needs individually and give you our specific recommendation. Do not get off your medications without working with your prescribing doctor. Will my symptoms get worse during treatment? Every individual patient is different when it comes to their experience during EPIC Treatment. However, it is common for patients to experience ups and downs with various symptoms throughout the week. Our therapists and trainers are very good at helping you through any increase in symptoms. Typically, our patients leave feeling better than when they started. Occasionally, it can take a few weeks for patients to feel the differences their brain has made during treatment. When we follow-up a few weeks after treatment, once patients are established in their daily lives, they report feeling much better. Can I drive during my week of EPIC Treatment? We do not recommend driving yourself to and from treatment. EPIC Treatment can be exhausting and can impact your ability to drive safely. If you are staying at the hotel we work with, they provide a shuttle service. Do I need to have someone come with me during Treatment? It is helpful to have someone with you when we review your fNCI results in your report of findings. This typically happens on your first and last day. The rest of the treatment is very focused on the patient and we do not allow others to be in the room with their loved one. It can be helpful for you to have support throughout the week in which case we have a waiting room for anyone who comes with you. Where will I stay if I am not from Utah? Cognitive FX works closely with a local hotel to give you special rates, along with shuttle services to and from treatment. They will also go grocery shopping for you, take you other places close by, and the hotel rooms have a kitchenette so you can cook. In your consultation, we will give you more information on how to book with them. When should I arrive for Treatment? If coming from outside of Utah, we suggest you arrive one to two days before treatment. If you are coming from another country we encourage you to come two to three days before in order to adjust to the time zone difference. We will send your schedule to you a week or two before treatment. Please be sure to check your email including your spam folder for this schedule. On your first day of treatment, please arrive fifteen minutes early. How long after an injury should I come in for Treatment? Typically, if your concussion symptoms have lasted for more than 30 days we encourage you to schedule a consultation. During this consultation, we will give you specific dates we have availabilities for treatment. Based on our research, we can successfully treat injuries that are anywhere from 1 month to 60 years old. What is the Cost of EPIC Treatment? Depending on your specific needs and the choices you make during your consult prices can range from $8900 - $13315. Do I need a physicians referral to get EPIC Treatment? You do not need a referral to get Treatment. We do however need you to complete our new patient paperwork and to schedule a complimentary consultation here. On the paperwork, we include a spot for you to put your doctor's information if you would like to share that information with us. If your doctor is requesting a report or update they can send a referral to us online or via fax at 888-511-1397.